Harvest Thyme Homestead: I Think I Am in Love!!! Oh, no, I think I am in love............with this face......with this sheep.....oh no!! So, as a single, hobby farm woman with no one "directly" to answer to (except Mom and Dad and I usually still lie to them about "certain things") I made a firm decision. I emailed Kelly Smith at Hopping Acres who breeds Black Leicester Longwools and guess what??? I am on a waiting list for a ewe lamb!!!!! Isn't that cool? No, seriously, isn't that flippin' awesome? No, seriously, am I crazy? Don't you just want to run your fingers through those beautiful black locks of wool? All joking aside.........I think I am in Love! Congratulations on the soon to be new addition to the family! Cool! Congrats. 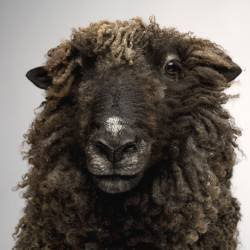 I need to figure out what type of sheep I want and soon! I tagged you, come on over and check it out! Seriously! That IS flippin' awesome! And I just had to award you my own "Wonderfully Woolly" award that I came up with tonight, on my blog, because it is indeed, that awesome! Congrats! Congratulations! Good for you. I am also looking forward to seeing pictures of your new little baby when it gets to its new home. Congratulations Kristi! He does have a very loveable face :) I've never seen their fiber close up but I understand it is fabulous. You only go around once girl - if it's something you really want to do with your life, go for it!! Gorgeous, you go for it girl! Oh, I saw at the feed store that someone in Canal Fulton is giving herding lessons. Though I'm sure Dix having her own flock knows exactly what to do. Will there be another "birth announcement" placed on the board?